Join us at Yurihama’s Chinese Garden Enchoen for a wonderful night of entertainment, including various food vendors, captivating Chinese water acrobatics, and a dazzling display featuring 2,000 fireworks! The Yurihama International Friendship Association (YIFA) hosted a Chinese tea ceremony event at the Enchoen Chinese Garden on Sunday, February 18, 2018. 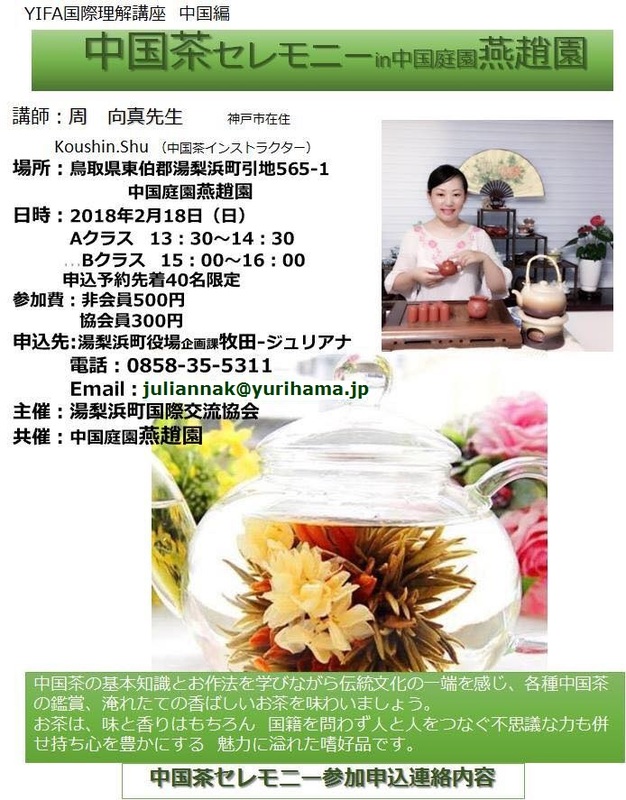 Guest instructor Ms. Koushin Shu, who teaches about Chinese teas in Kobe, introduced the various types of Chinese tea and spoke about their different health benefits. Following the lecture, participants were treated to a sampling of several delicious and fragrant teas. The Yurihama International Friendship Association (YIFA) holds events throughout the year aimed at promoting cross-cultural understanding. This February, YIFA invites you to come and enjoy a traditional Chinese tea ceremony led by Ms. Shu Koushin at the Enchoen Chinese Garden. Participants may choose from 3 courses: Course A, Course B, and Course C.
The 12km Course A (Lap Around Lake Tōgō) takes participants around the scenic Lake Tōgō, which is considered to be one of the most beautiful spots of the San’in Region. Though long, this course is generally flat, except for the stretch between Ayame Pond and the Mt. Izumo Lookout Point. 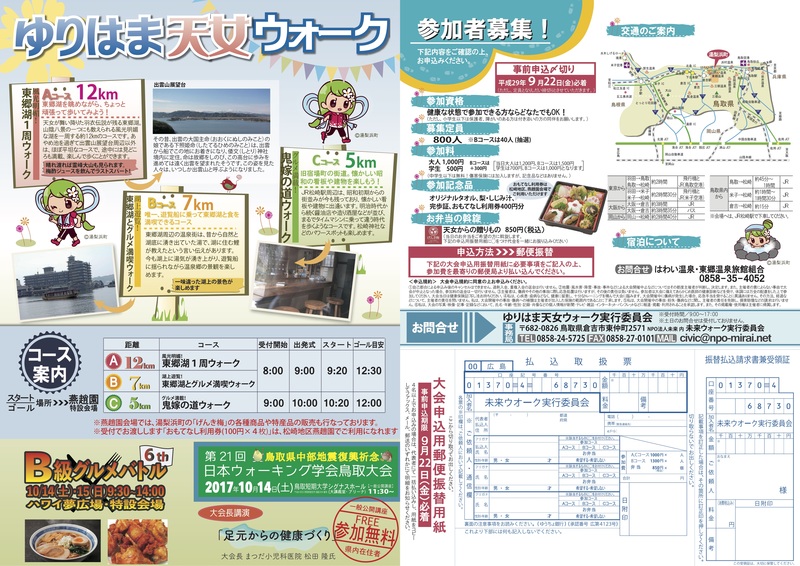 Course B (Lake Tōgō and Local Treats Walk) is a 7km course offers participants the chance to take a boat ride on Lake Tōgō and enjoy some local dishes. 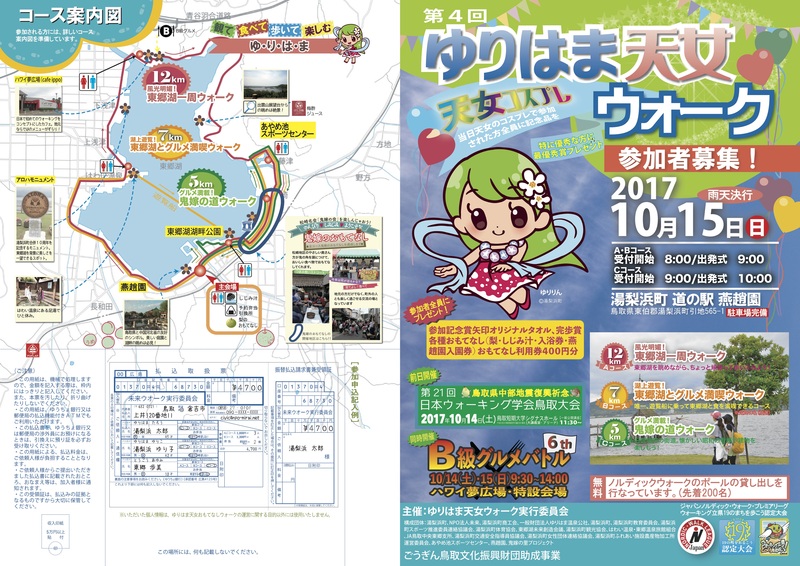 Participants who select the 5km Course C (Oniyome Path) will be able to enjoy the retro atmosphere of the Matsuzaki district of Yurihama. Making use of the beauty of the area surrounding Lake Tōgō, Chinese Garden Enchoen is an authentic Chinese garden that opened in 1995. It was constructed in the style of those built and beloved by Chinese emperors, with all materials for the buildings and stones for the garden specifically made in and imported from China. 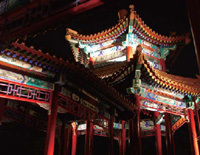 Inside the garden, guests can experience traditional Chinese culture through performances- including Chinese acrobatics, lion dance performances, and more. Enchoen is one of the largest Chinese gardens in Japan, serving as a foothold in the friendship between China and Japan.